13 February/March 2018 unmanned systems inside 20Si 200Sr The smallest, lightest Mode S Transponders ALL-IN-ONE DESIGN INTEGRATED SBAS GPS/BARO COMPLETE RADAR AND ADS-B VISIBILITY EASY PLUG & PLAY INSTALL 76 grams 250W Transmit 200+ mile range 25 grams 20W Transmit 40 mile range RADAR CONTACT ESTABLISHED uAvionix.com are about to become much more profitable than small UAS. The Advantages of Large UAS Small UAS still have a tough path ahead to BLOS operations. Small UAS can only f ly below 400 feet currently and there's a lot of things to run into at that altitude— manned aircraft, buildings, towers, birds, balloons, kites, power lines and, of course, other drones. Aircraft in controlled air- space only have to worry about the oc- casional RE ALLY dedicated bird, in- truding/uncooperative manned aircraft (guys who aren't supposed to be there or who don't have the right navigational equipment) and a weather balloon every now and then. Look at that CAS Stack I mentioned before—the only aircraft below 400 feet are the small UAS and aircraft (Apaches and A-10s) with the armor to survive everything you can run into be- low 400 feet. Everyone else does just fine above 400 feet. 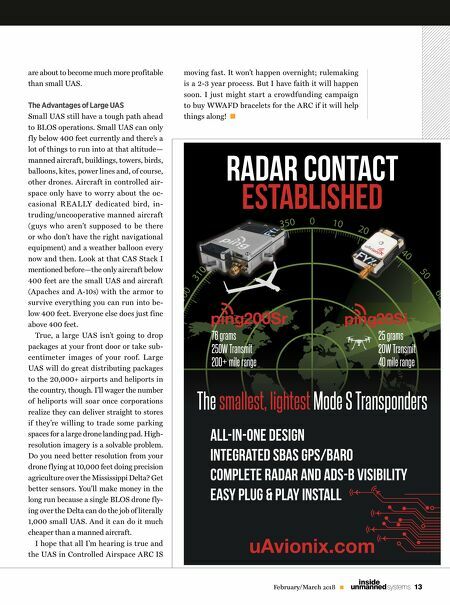 True, a large UAS isn't going to drop packages at your front door or take sub- centimeter images of your roof. 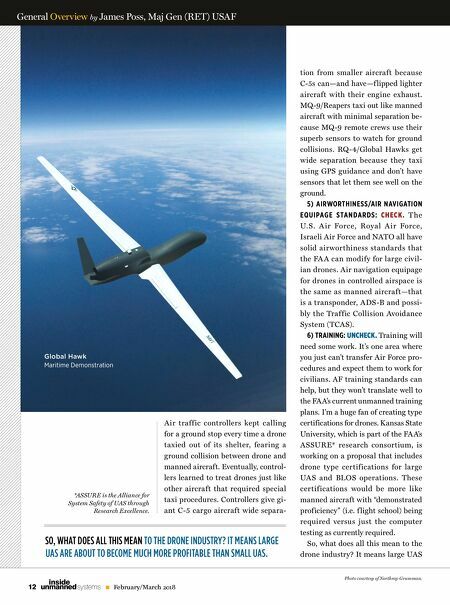 Large UAS will do great distributing packages to the 20,000+ airports and heliports in the country, though. I'll wager the number of heliports will soar once corporations realize they can deliver straight to stores if they're willing to trade some parking spaces for a large drone landing pad. High- resolution imagery is a solvable problem. Do you need better resolution from your drone f lying at 10,000 feet doing precision agriculture over the Mississippi Delta? Get better sensors. You'll make money in the long run because a single BLOS drone f ly- ing over the Delta can do the job of literally 1,000 small UAS. And it can do it much cheaper than a manned aircraft. I hope that all I'm hearing is true and the UAS in Controlled Airspace ARC IS moving fast. It won't happen overnight; rulemaking is a 2-3 year process. But I have faith it will happen soon. I just might start a crowdfunding campaign to buy W WAFD bracelets for the ARC if it will help things along !